Good news: my latest book for product managers has just been published! You can order your copy by clicking here. This book has been written with one goal in mind – to show you how you can make your product management career a success. It’s not easy being a product manager so we’re going to show you what you need to be doing in order to make you stand out and be successful! Let’s Make Your Career A Success! Congratulations – you are a product manager. Or you want to be one. No matter where your career is at right now, what we need to have a talk about is how you can take it to the next level. Being a product manager is a strange sort of job. It turns out that you don’t actually “do” anything. Instead, it’s your job to get a lot of other people to do all of the things that are going to be required in order to make a product or a group of products be successful. Needless to say this is a hard thing to do. However, as hard as that is, there is something else that you need to be doing at the same time: managing your career. Look, the success of your product is never only in your hands. Market conditions, what your competition does, and the whims of your customers will all conspire to either make your product a success or a flop. No matter what the final result is, and often we don’t even get to stick around for the last chapter, you are going to want your efforts today to move your career forward tomorrow. What this means for you is that you need to understand what it is going to take to get the rest of your company to recognize the good work that you are doing today and the potential that you have for tomorrow. The good news is that this can be easily done. You just have to know how. Product managers can get caught up in the details of their product. There always seem to be new requirements to create, product launches to schedule, and features to document. However, the secret to being a successful product manager is to realize that the job is really about having good communication skills. It’s the people that you work with both inside of your company as well as outside of your company that will determine how far you’ll go in your career. This book has been written to give you a helping hand. I want to get you to take notice of the day-to-day things that are going to play a role in determining the next step in your career. It’s not going to be your technical knowledge or your understanding of your market that is going to help you to move to the next level, but rather how others perceive you. 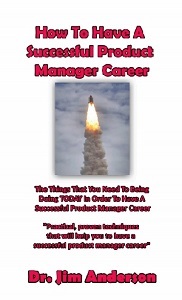 Contained in this book are the tips and tricks that you are going to need in order to take control of your product manager career. As you read each chapter, take a moment to think about how you can start to use the information in your job immediately. I think that you are going to be both surprised and pleased with just how much this information is going to help you take your product manager career to the next level! You can order your copy by clicking here.